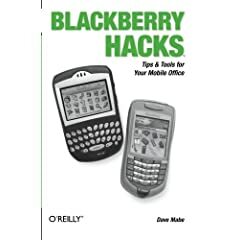 My new book, BlackBerry Hacks, arrived at my doorstep last week! It turned out quite well. The book comes with a 45-day free trial to O’Reilly’s excellent Safari Books Online which I’ve been using for a while now and I love it. Thanks again to all the contributors that made this book a success! This entry was posted in BlackBerry, Everything on October 18, 2005 by Dave.